Starting At 500 Pounds: Eat Like Cookie Monster and Lose Weight! 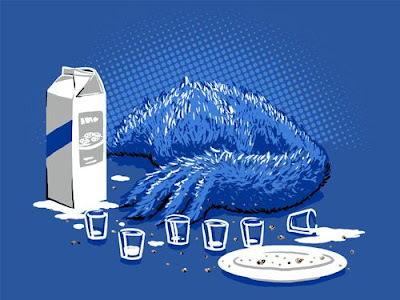 by Tjost called "The Binge"
As much as cookie monster loves to eat, he is actually really bad at it. I think the key to weight loss is not having any lips. As Mr. Monster gets more and more excited about food, he bursts into a feeding frenzy and begins to shove food into his mouth. The secret is that the food falls out before it's consumed. While 100% of the cookie enters the mouth the lack of lips allows 95% of said cookie to fall out of his mouth and onto the floor. Based on this investigation I have determined that the key is to remove my lips. Without lips holding the food in my mouth, only a fraction of what I put in my mouth would stay there. If only 5% of what I put in my mouth ended up in my stomach I think I would be at the end of my weight loss journey already. I am starting to understand why he is always so hungry now. Continuing on the theory of lipless animals, ever heard of eating like a bird? No birds I know have lips. If there is one, I bet he is overweight. Who knew your kisser could be so detrimental to your weight loss success? 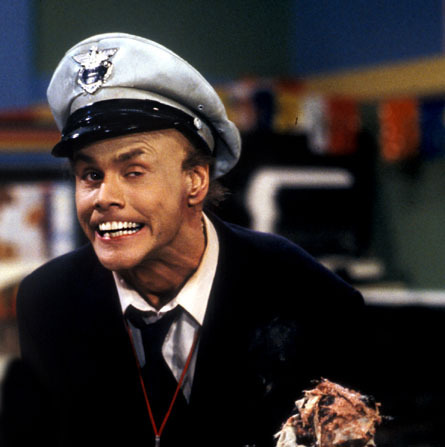 I think Fire Marshal Bill must have figured this out a long time ago because he too is lipless and thin. Unfortunately my theory is somewhat flawed. If lips were a measure of someone's ability to lose weight, by the same logic, Angelina Jolee should be huge. How many different ways and ideas will we come up with to lose weight? Ridiculous ideas like removing your lips is not too far off from the crap I have seen lately. The sooner you accept the fact that proper diet and exercise is going to get you fit the faster you will be able to get to work and get going. Cute post. I love the pictures and on a side note, I can't stand Angelina but I love Cookie Monster. I wish I could eat like him! Love some of the movies she is in like SALT and Mr. And Mrs. Smith. Can't stand her off the screen though. She is just not my idea of attractive. I am still paying for those darn cookies I ate last weekend (there were many....). lololol....Now I want that t shirt. I haven't laughed that hard in a while.